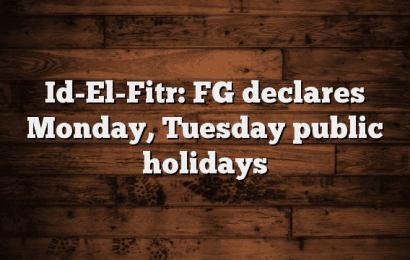 The Federal Government has declared Monday, June 26 and Tuesday, June 27 as Public Holiday to mark Eid el Fitr. Minister of Interior, retired Lt.-Gen. Abdulrahman Dambazau made the annnouncement on behalf of the Federal Government on Thursday in Abuja. He‎ enjoined all Muslim faithful and Nigerians in general to use the occasion of the celebration for sober reflection and pray for peace, unity and progress of the nation in its march to nationhood. ‎Dambazau urged all Nigerians to shun hate speeches and divisive tendencies and join hands with the government of President Muhammadu Buhari to build a peaceful, strong and united Nigeria. He assured of a Nigeria, ‎which guarantees fundamental freedoms, including the right of residence in any part of the country, as enshrined in the Constitution of the Federal Republic of Nigeria. ‎The minister reaffirmed the determination of the Federal Government to protect all lives and property of Nigerians. He warned hoodlums not to test the will of the administration. The minister said the government has the capability to deploy security agencies to deal with any individual or group that may threaten the corporate existence of the nation, as well as the peaceful co-existence of the people. He ‎further assured Nigerians of the government’s resolve to be just and fair to all.